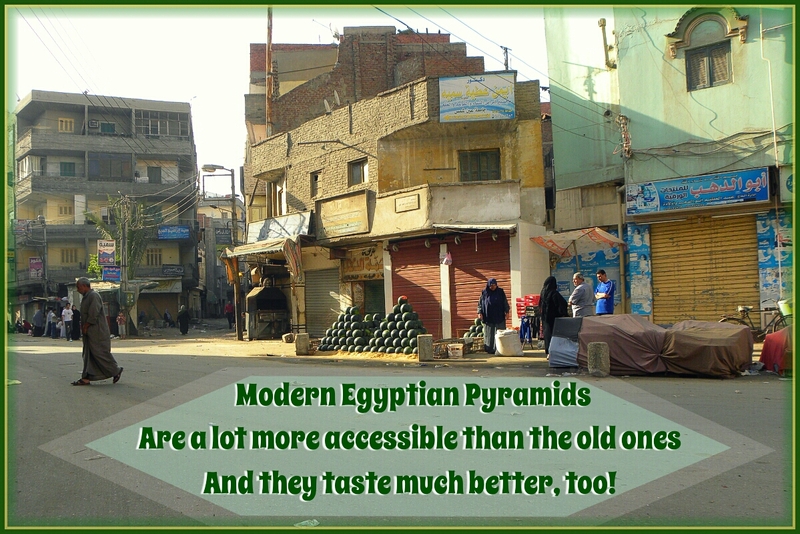 Modern Egyptian pyramids are a lot more accessible than the old ones, and they taste much better, too! Early mornings are a great time to see strange sights in Egypt. I’m happy to report that pyramid building is still in the DNA of the Egyptians, and the market is the best place to see this skill displayed. Summer is juicy sweet watermelon season, and all the vendors have stacked up huge numbers of them just like pyramids. 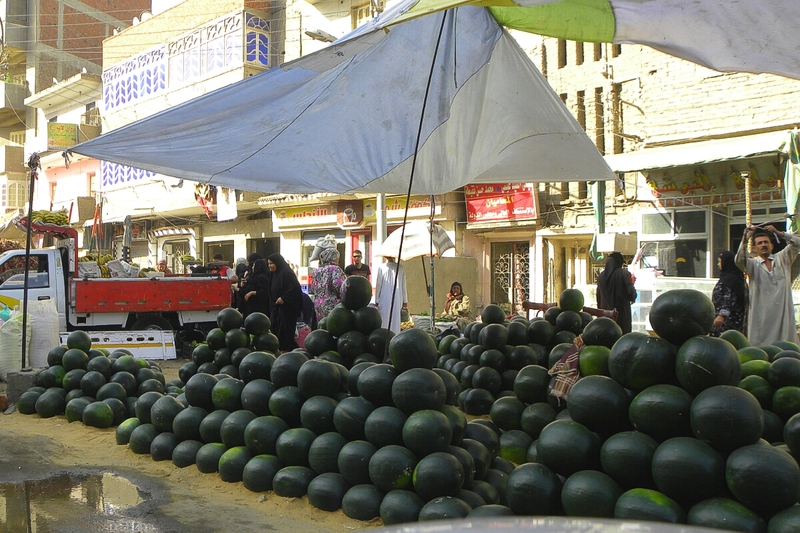 Today we went to the market, bought a few more watermelons, and saw the pyramids, too! Hi Aisha ! Those Egyptian pyramids are a great wonder to ponder upon the mysteries of universe and I love them. But I am sure your pyramids were not bad enough 😛 Enjoy your melons and have a great day . Love you. Mm.. very delicious watermelon, I love it 🙂 Aisha you have an fantastic photo shot ! Assalamualiukum Aisha dear, warm regards from my heart. Oh, I love watermelon 🙂 Plenty of good ones in Spain, too! I can’t wait every year for the season to start! Absolutely 🙂 How lucky am I! Does Egypt have good cakes…? I love your photos and the thought that on the other side of the world, watermelon is also being enjoyed right now. Thanks for your posts. How perfect! Produce pyramids. Way to capture the culture there! This is beautiful and what a great marketing strategy! Hehe it’s a great way to feature the yummy watermelons 🙂 So inventive! Haha! This made me smile 🙂 I know what you mean though, it’s great being in country where exotic fruis are so readily available – and cheap! I found I missed them quite a lot when I went back home to the UK for a visit! My goodness. Look at all those WATERMELONS!!! I LOVE going to market! !